This 7.5 lb. HERSHEY'S® chocolate syrup is perfect for topping ice cream sundaes and blending into milkshakes! Drizzle rich and creamy chocolate flavor over cheesecakes, cupcakes, brownies, parfaits, and pancakes. Perfect for your ice cream shop, bakery, or restaurant, this smooth chocolate syrup is a quick and easy way to enhance the appearance of just about any dessert. The 7.5 lb. jug is easy to transport, features a resealable cap to keep your product fresh, and will keep your business or catered event in good supply. For supreme taste and genuine flavor, trust HERSHEY'S® chocolate syrup for your sweet treats! Good price compared to having to buy smaller bottles. The only reason I took away from the stars is because it’s hard to find a pump for this bottle and it can get messy trying to refill other bottles. The 7.5 pound jug allows for easy pouring into smaller containers to utilize on a daily basis or sundae bar. The shape of the jug also allows for easy storage in the door of a refrigerator. The Hershey's brand is impeccable in taste in comparison to other brands. We highly recommend. Hershey’s is always a great flavor. We use this for a hot chocolate (steamed milk and syrup). Our customer LOVE it and we love the price! Tastes great! Excellent price! Use it to refill my regular size Hershey’s bottles. Very easy to pour and comfortable to hold. Fits in fridge door with no issues. How can you save money... buy in bulk whenever you can. Yes this is cost effective and of course still name brand. Everybody loves Hershey's! such a great price! it just tastes like hershey chocolate! it makes a great addition to coffee or blended drinks. We usually just order it in bulk and always keep it on hand. We love the larger size bottle and the easy handle for pouring. The price is good and the product is great tasting. The Hershey's brand is a big draw for our ice cream shop. You can't go wrong with Hershey's. We use this chocolate syrup for our ice cream sundaes and in milkshakes as well. Customers love the quality of this chocolate and overall it makes great products! The bottle size is great too! Great product and a easy to pour jug. This Hershey's syrup is delicious and tastes great on our ice cream sundaes. We also mix it to make our chocolate milks! A really nice bulk size tub of Hershey's chocolate syrup that is excellent quality and tastes great on ice cream. It also makes the best tasting chocolate milk. 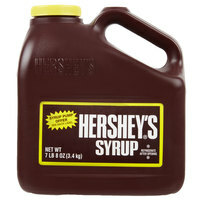 The Hershey's Chocolate Syrup jug comes with a handle for easy holding and is sealed for safety. I love that it's a nice size, not too small where I would go through it too quickly and not too big where it's hard to handle. There is a silver safety seal under the lid. I usually receive my shipment with a plastic bag wrapped around each jug or two jugs to ensure it doesn't create a mess if the item arrives damaged which is a great idea. I really enjoyed the Hershey's Chocolate Syrup the lid provides extra protection and storage in the fridge. The handle is also an added bonus for refilling of products, it truly lives up to its name. Love Hershey's Chocolate syrup. This bottle will last a long time. The container holds the syrup well inside. The challenge is when you pour the syrup into a small container for serving. Authentic Choco Syrups. How can you possibly give less than 5 stars to Hershey's syrup? Add milk and it's the world's most awesome comfort food! :-) We use it a lot for our frappes, waffles, pancakes, egglets, ice cream toppings. Can never go wrong with Hershey's brand. This Hershey's Chocolate Syrup is great for use on ice cream or anything. Rich and not too sweet. The HERSHEY'S chocolate syrup is a favorite topping at our shop. We put it in a squeeze bottle and keep it warm to put on sundaes and specials!! It tastes great!! This is another chocolate syrup that is delicious. I really like the fact that it comes in a big 7.5 lb jug. It really makes things a lot easier on us. There’s not much to say about classic Hershey’s Syrup. This jug is good to have and we fill our little bottles from the big jug. Buying the bigger jug saves money. The Hershey's chocolate syrup jug is great the chocolate syrup is fabulous. The jug works great with our pump and is great for making chocolate sundaes. Great value for the money. Excellent shipping and in the most convient packagaing. I use this versus other chocolate as it incorporates better into the drinks we make. This jug of syrup is great! A lot easier to deal with than the can of sauce. Usually what doesn't fit in our squeeze containers need to go into oddly shaped plastic containers into the fridge. This is great, however, as it's ALREADY in it's own container! This syrup has a good flavor. Not to chalky or fake. It's nice that it can be resealed. Works great with coffee to make fun drinks. Hershey's is a delicious syrup. We need the large size to meet the demand of our ice cream stand customers and this jug is easy to handle. This syrup is so yummy! I love that you can buy it in such a large quantity as it's less of a hassle than buying tons of the smaller squeeze bottles. We wouldnt use any other syrup than Hershey's. We enjoy that this is now available in a jug as opposed to the #10 can. Would highly recommend! can't go wrong with chocolate especially hershey's! we use these for everything. easily stackable in the box. always come not broken so its packed well. Hershey's is always a good choice and this is no different. Make sure to get the pump with the correct diameter and you won't have any issue with this product. This chocolate syrup has a great price and is cheaper than my food suppliers pricing. Hershey's syrup is the best brand and we use it for dessert as well as chocolate milk. I bought this for home use only, My daughter loves chocolate milk and we all know Hershey's syrup makes the best chocolate milk in the world. She was shocked to see such a large jug. I'm now voted best dad on the block. This seven and a half poung jug of Hershey's chocolate syrup is portable, easy to carry, convenient, and best of all, delicious. It's design (handle and mouth) makes it easy to pour without making a syrupy mess. This product is amazing, we use it everyday! We love this product and regularly use this because it taste very nice and the texture is wonderful. We thought it would be better to purchase the 7.5lb jug if syrup, instead of the smaller bottles, since we use so much of it. It arrived quickly, wrapped well and in an easy to store container! Hershey's Chocolate syrup is the best chocolate syrup on the market. I use it one ice cream and in milk to add great flavor to my desserts.